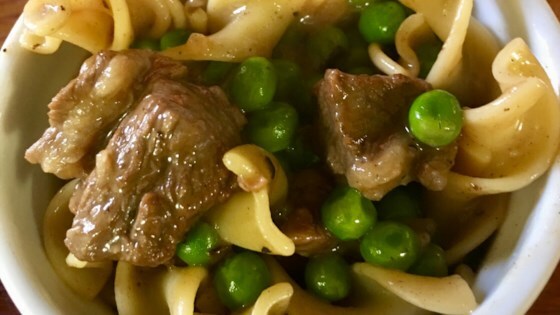 "The best beef and egg noodles you'll ever have. Affordable, quick, and yummy! I have to give credit to my grandma. She used to cook this for her 5 kids and then later for all her grandkids." Heat a skillet over medium-high heat; cook steak, working in batches, until seared and browned on all sides, about 5 minutes. Transfer seared steak to a plate. Melt butter in the same skillet over medium heat and saute onion until softened, 5 to 10 minutes. Add steak to onion and pour beef stock over steak; season with bay leaves, thyme, salt, and pepper. Bring to a boil, reduce heat to low, cover skillet with a lid, and simmer until steak is tender, 50 minutes to 1 hour 50 minutes. Stir peas and cornstarch into steak mixture; cook uncovered until liquid thickens, about 10 minutes. Bring a large pot of lightly salted water to a boil. Cook egg noodles in the boiling water, stirring occasionally until cooked through but firm to the bite, about 5 minutes; drain. Serve beef mixture over noodles. I followed recipe but mine was dry. Maybe I should of tweaked it. We loved it! & my husband is picky, I almost didn't put the peas in but I am glad i did. i cooked the noodles in the remaining beef stock. I will make this again. Easy and very. With 3 picky boys they ate it up.